"THERE IS SOMETHING BIG AND SCARY IN THE YARD!" GASPED TAIL, THE SQUIRREL. The Chicken Squad--the chicks Dirt, Poppy, Sweetie, and Sugar--pop out of their green shoe. Dirt sees that there is a mystery afoot, and notebook in hand, she starts to interrogate Tail for more details about the intruder. Master of the thesaurus, Tail can only add that the thing is also enormous and frightening, huge and terrifying! "BIG IS NOT A SHAPE!" SNAPS DIRT. Dutifully, with crayon in hand Sugar takes over basic shape instruction, but when she draws a circle, Tail faints dramatically on the floor of the chicken coop. YIKES! Their mom, Moosh, is out in the yard! The chicken squad mobilizes for undercover action. "QUICK!" SAID SUGAR. "POPPY, SWEETIE, GO TO THE SUPPLY ROOM AND GET ME GRASS CLIPPINGS, A BAG OF ROCKS, A BALL OF STRING, A TANK OF HELIUM, AND AN ORANGE BALLOON." "CHICKENS COULDN'T POSSIBLY HAVE ALL THOSE THINGS!" SAID TAIL. "THEN YOU DON'T KNOW CHICKENS!" SUGAR REPLIED. And when J.J. Tully, retired search-and-rescue dog, is awakened from his nap by the sound of rocks pinging off Barbara's brand-new barbeque grill, thrown by four suspicious, skinny-legged clumps of grass, he knows his fuzzy yellow charges are at it again, in the first book of Doreen Cronin's new series, The Chicken Squad: The First Misadventure (Atheneum Books, 2014). Snappy comebacks and hilarious barnyard banter have been long been Cronin's forte' and Kevin Cornell's full-page comic illustrations bring back J.J. Tully and Mama Hen Moosh's chipper chicks in a happy continuation of the earlier series, which began with The Trouble with Chickens: A J.J. Tully Mystery. (J. J. Tully Mysteries) . "WHAT HAPPENED TO THE ALIENS?" ASKED TAIL. "THEY WERE AFTER FOOD. THEIR WHOLE SPACESHIP WAS FULL OF HOT DOGS. THEIR SHIP IS DOWN FOR GOOD." SAID SUGAR. "AND WE THOUGHT THEY WERE HERE FOR US," POPPY LAUGHED SCORNFULLY. "LIKE ANYBODY WOULD EAT A CHICKEN!" 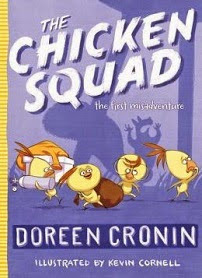 Be sure to read this one with its latest sequel handy, By Doreen Cronin The Case of the Weird Blue Chicken: The Next Misadventure (The Chicken Squad) [Hardcover] (Atheneum Books, 2014) for more merry misadventures of the chicken squad.